There are many versions of Marzocco adorning public spaces in the city of Florence, Italy. 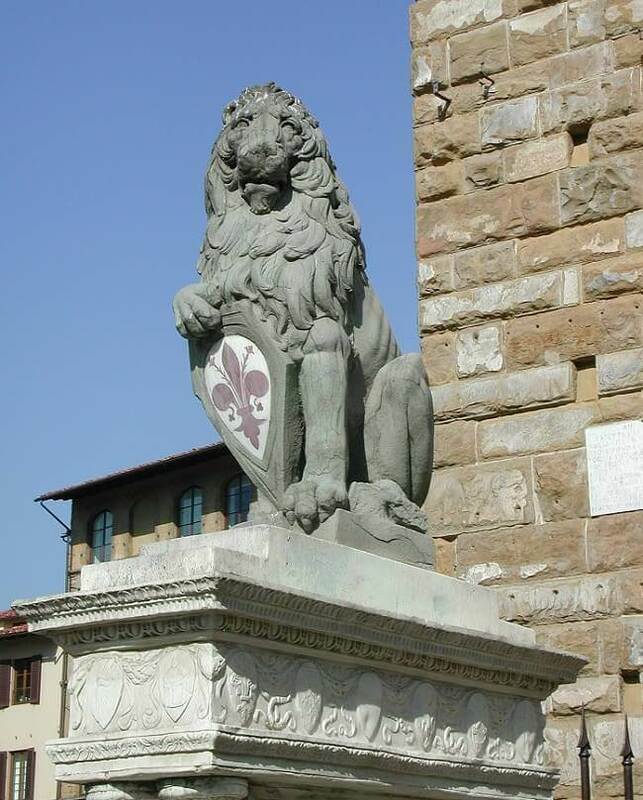 These statues depict a heraldic lion and pay tribute to the city of Florence by symbolizing the Florentine's bravery, stateliness and nobility. Donatello's Marzocco is undoubtedly the most famous amongst the many existing renditions. The piece was made between 1418-1420 and was originally installed at Santa Maria Novella. The insignia representing defense from the Republic of Florence sat on a column in front of Pope Martin V's apartment at the bottom of a great staircase. Donatello sculpted his Marzocco out of a gray sandstone that originated in Tuscany and was called "pietra serena." His lion is seated cradling the Florentine coat-of-arms. Donatello embraced his traditional style by making the figure extremely lifelike. The eyes of the lion are proud and wise. The upper torso of the lion is extended to highlight a lush mane and its posture creates the effect of humanizing the creature. The head of this lion is appealing to us precisely because it is so anthropomorphic. The effect is not casual or humorous, but reflect	contemporary concern with interpreting physiognomy and character in humans by reference to the animal world. Michelangelo is reported to have said that he had never seen anyone who looked more like an honest man than Donatello's figure. Around 1515 the staircase at the foot of the papal apartments was demolished. In 1812 the Marzocco was relocated to the Piazza della Signoria before being installed in the Bargello for preservation. A replica now sits in its place in the Piazza della Signoria.